Love how quick it acquires signal. My only complaint is the topo map. GARMIN real gives you the finger with there top maps. The ST is significantly more expensive the plain 64. the price in my opinion does not justify the extra GB space the very, very plain topo. considering you can buy a 16 gb sd card for under 20 bucks don’t waste the money on the 64. I will explain why I am not of fan of the topo. 2-the apps uses very detailed 10 ft elevation change USGS maps overlayed over your position. 3-you could switch between a Google aerial views on your current location. 4-due to the touch screen nature and the fact that the apps are designed for hunters they had convenient waypoint markers that could be used to designate tree stands, game cameras, trails etc. 5- I travel a lot. Serving in the military I do not have the luxury of hunting my own private land. So generally every 2 years or so I have to start all over again. and the apps allow me a lot of flexibility especially for still hunting and and I absolutely love it. the problem with the app and the phone is it is very reliant on your phone coverage and even with good signal it takes quiet a bit for it to acquire a signal. and that’s not to mention battery life. I pulled the trigger on this unit for its exceptional review. I also went ahead an purchased the ST for the 100k topo maps already installed. and I love the unit for its accuracy and fast signal acquisition but the maps just are not worth the extra money. Luckily online you can find some very good FREE but limited 24K maps. and some almost comparable to the USGS maps. If I were to do it again I would purchase the 64 save the extra almost 100 dollars and maybe by a 16gb sd card and the 24k maps from garmin. or use the free ones. 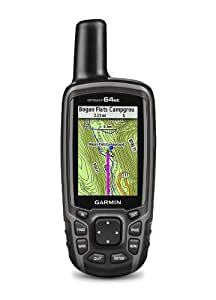 After using, and loving, the Garmin GPSMAP 60CSx for years, I decided to “upgrade” to the GPSMAP 64st. Mainly, I wanted the much more finely detailed map of the US, but the built-in Bluetooth connectivity also seemed interesting and possibly useful. I also wanted the ability to save more tracks and longer tracks. Now that I have used the 64st for a few months, I can say that the 64st is not nearly as good as the 60CSx. In most of the ways that matter to me, the predecessor 60CSx is better. Where the 60CSx felt like it had been designed by someone who actually hiked and depended on a GPS unit, the 64st feels like it was designed by a committee whose main goal was to come up with bullet points to appear in an advertisement. To begin with the battery life of the 64st is abysmal. The batteries on the 60CSx last at least 2 to 3 times as long as those on the 64st. To even come close with the 64st, you have to turn off features like Bluetooth and GLONASS and use the display “battery saving” mode (which means the the screen is not on unless you press a key). To get around this, the manual suggests that you use (ultra high priced) lithium batteries. You could also use rechargeable batteries (good luck getting them recharged when you’re out on a 4-5 day hike). Even the user manual for the 64st is a minimalist document which appears to be designed to prevent you from finding how the 64st is supposed to work. The 60CSx manual is 116 pages long and is very compete. The 64st manual is 18 pages long. It contains only the most basic information. For example, the 64st has a setting called profiles. Profiles appear to be designed to save a collection of settings. The manual contains no information about the profiles that are included with the 64st or what settings are affected by a profile. The profiles included with the 64st are “Classic”, “Hiking” and “Geocaching”. There is no information in the manual explaining the difference in the profiles. “Classic” is the default. I thought that since I mainly use the GPS for hiking, I would change the profile from “Classic” to “Hiking”. That was a big mistake. When the “Hiking” profile is selected, the 64st tries to “Calculate” the route (just like an automotive GPS would). Of course, since the device doesn’t have most trails built in, the “calculation” always fails– it never finds a route. Even if it could “calculate” the route it would be of little use since it has no way of knowing what route you want to take. I have had frequent trouble with the 64st including nonsense points in a track leading to absurd odometer readings. Before the start of a hike, I wait for the GPS to get a good solid satellite position and a good location. Then I reset the trip odometer and other trip settings to zero. I start the hike and discover a minute or two later that the 64st thinks I have hiked 60 miles! Its clear that the 64st had gotten at least one spurious point and included it in the odometer mileage. How hard would it be for the GPS to deduce that it is not possible to travel 24,000 miles per hour and ignore the spurious track point? There are some good things about the 64st. The built-in map is much more detailed than the one that comes with the 60CSx. When you are on a hike and you come to a road– even a back-country dirt road, the 64st will likely be able to tell you the name of the road. The 60CSx only knows about major roads and not even all of those. The Bluetooth connectivity could be useful. You could, for example, download a GPX track on your smart phone and transfer it from your cell phone to the 64st via Bluetooth. The 64st has a lot more memory and can store much longer tracks than could the 60CSx (10,000 points versus 2,000 on the 60Csx) and can store many more tracks..